Stilton resident and Huntingdonshire District Councillor Tim Alban is a keen supporter of local heritage. Tim represents the District on the Great Fen steering group, one of Europe’s most ambitious landscape reclamation projects, which has an important heritage component. 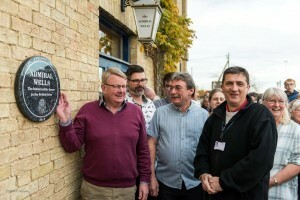 The Fenland Trust and Great Fen unveiled a memorial dedicated to Spitfire pilot Harold Penketh in 2016 and the following year Tim joined residents and media at Holme for the unveiling of the Fenland Trust’s “lowest pub” plaque at the Admiral Wells. Tim has been following the development of the Beverley Nichols weekend with interest and the team look forward to inviting him to Glatton this September to learn more about one of Huntingdonshire’s most colourful characters.